Since 1900, only five switch-hitting shortstops have played long enough and well enough to amass 2000+ career hits. Maury Wills was the first, Larry Bowa the second, and Omar Vizquel continues to motor along (2841 hits as of 2011). 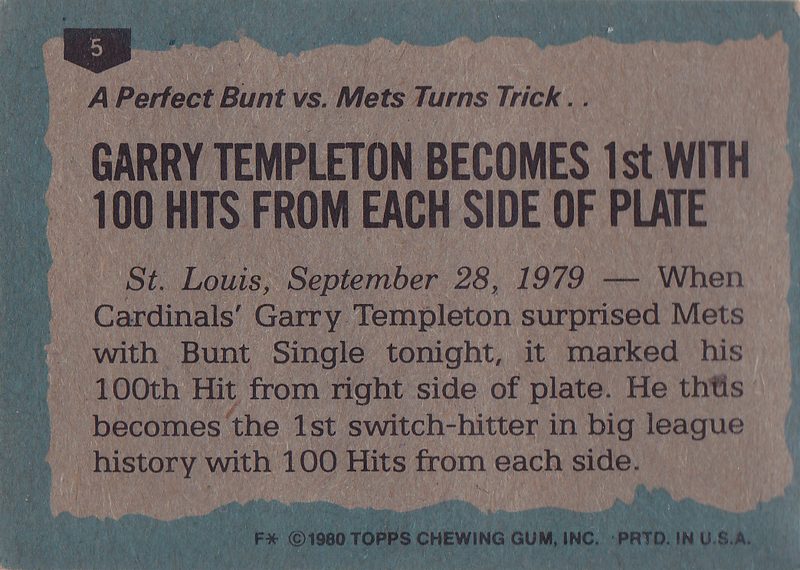 The other two were contemporaries and flip sides on one of the 1980s most significant trades: Ozzie Smith (who went from SD to StL) and Garry Templeton (vice versa). On paper, the trade made sense, as StL needed more defense and SD wanted to resolve contract issues with Smith. 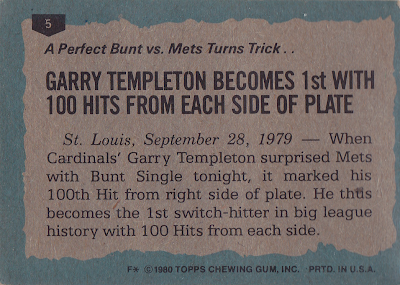 Ozzie boasted a better glove and Templeton swung a bigger stick. If things stayed simpatico, both teams could shore up overall weaknesses. 1980 marked the first year I really got into baseball cards. Down the street, my friend Brandon picked up a bunch and buying my own proved an excellent excuse to hang out and swap. We both followed the Mariners, but Seattle didn't field players worthy of these highlight cards until the 1990s, when Ken Griffey, Edgar Martinez, Randy Johnson, and Alex Rodriguez started doing what they did best. Value: Most 1980 singles cost a dime or nickel and the stars top out at a couple of dollars. Rickey Henderson remains the key rookie card. 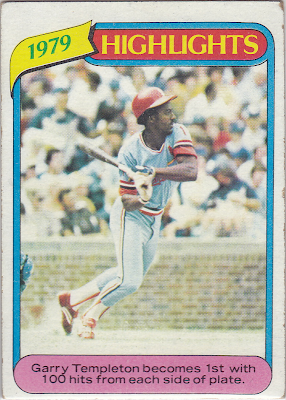 Fakes / reprints: Haven't seen Topps include any "highlight" reprints in their modern sets.